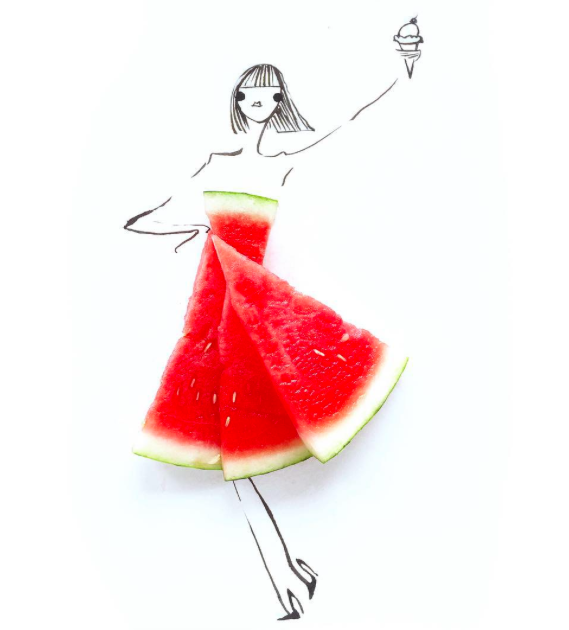 In the ever-expanding crowd of artists on Instagram, Gretchen Roehrs stands out with her whimsical fashion illustrations created with a few fine lines of ink and fresh produce, meats and other edibles. The San Francisco-based artist spent time in New York working behind the scenes of the fashion industry before moving to the West Coast to pursue illustration. 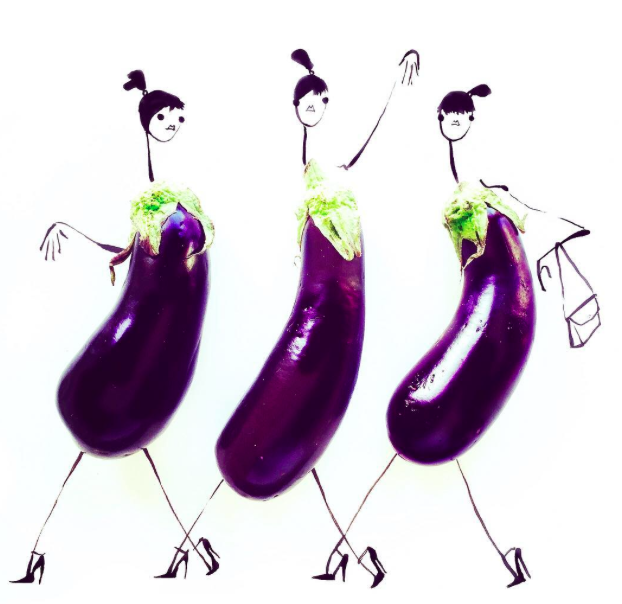 Food and illustration have long inspired one another, but not so much in terms of fashion. In the mid 1800s, Pierre Amédée Varin’s whimsical vegetable drawings featured cabbages with faces and hybrid asparagus people, and even before that in the 1500s Giuseppe Arcimboldo painted humorous human portraits out of vegetables and fruit. Roehrs offers a very welcome combination of food and fashion we haven’t seen yet. 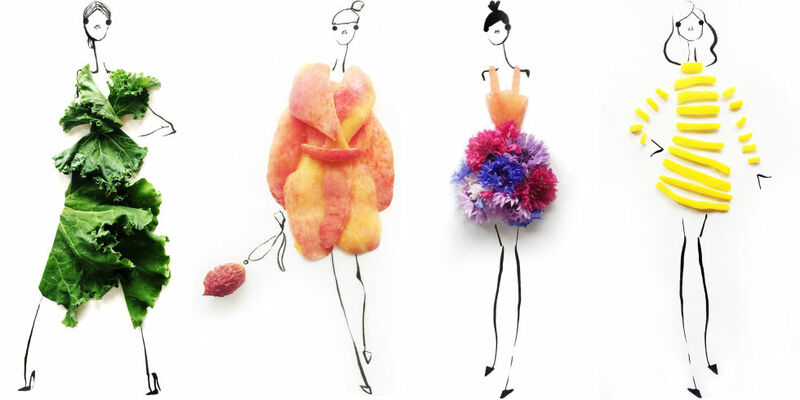 Harper’s BAZAAR: What’s the story behind using food in your fashion illustrations? Gretchen Roehrs: It all started as a bit of a taunt to a friend on the East coast who missed fresh fruits and vegetables during the winter months. I figured if they couldn’t eat anything fresh, they could at least laugh at a few ladies wearing blackberries as frocks. HB: Do you think food and fashion have parallels? GR: There are tremendous parallels between food and fashion. Both really cater to the visual sense, but it’s just as important that they have a pleasing texture. Fashion is a lot like cooking in that you can make up for average ingredients or fabrics with beautiful execution and care. Christina Tosi of Milk Bar does with with her delicious compost cookies just as well as Rei Kawakubo can turn a trash bag into a gown. HB: What’s your favorite food to work with? GR: Fruits and vegetables have always been so attractive to me, especially when they’re put on display every week at my neighborhood’s farmers market. They beg to be captured before I eat them! HB: Would you ever use junk food? GR: Ah, absolutely. I feel like I’ve been misleading everyone—I have an enormous sweet tooth (and a few cavities as evidence!) and I can’t wait to start using colorful candies and cakes. A bunch of colorful macarons seems like a good place to start. HB: Is there any food you’d never incorporate into your art? GR: Discovering good butter was the best thing that ever happened to me and it seems to make its way into everything I cook, but I can’t bring myself to make a butter dress. HB: What’s your favorite restaurant around the world? GR: San Francisco has an incredible food scene—State Bird Provisions is such a fun dining experience, and AQ does brilliant menus based on seasons. I’m also a diehard Tartine Bakery fan, so I’m thrilled Chad Robertson is bringing his unbelievable bread to New York and Tokyo this year. GR: I’m inspired by all sorts of everyday, mundane things. Color is huge for me, which is why I like cooking and drawing with the most vibrant colors and produce I can find. Walking through Chinatown is a sensory overload for me because of all the funny trinkets, exotic fruits and interesting smells. HB: Who are some of your favorite designers? GR: While I’m not brave enough to wear them, I am so taken with the subversive collections from Alexander McQueen and Hussein Chalayan. Chalayan’s coffee table dress was one of the first looks that made me fall in love with everything fashion could be. Personally, I think anything Jason Wu puts down the runway is exquisite. HB: What’s your artistic process like? GR: The food usually tells me what it wants to be, but sometimes I have to contort it into a look. From there I sketch around it and let it come to life.